5 May 2008. JMM begins doing a demo CD to promote our artists and our services. The demo CD will include performances for weddings, masses, vocal exercises, by two specific artists: Musica Chiesa (instrumentals) and C5 (vocals). These songs will be distributed to parishes, choirs, wedding organizers, etc. We hope that they would be interested to avail of Liturgical Music Workshops, weddings and special masses, and parish fundraising concerts. Musica Chiesa records the song Sandaling Pinakahihintay by UP Professor Agot (Augusto) Espino, which is a perfect song for weddings. These are the musicians: Mike Bulaong (keyboard), Silke & Twinkle Hipolito and Charisse Toledo, Criselda and Gerard Peren, Carlo Tuazon and Marian San Miguel (strings), Aris Tuazon (flute) and Jose Enrico Tuazon (cello). Robbie Grande and Jett Galindo were the sound engineers at SFX Studio, Jesuit Communications Foundation. Vocals by Mr. Quincy Gonzales (both Musica Chiesa and Canto Cinco member) and back-up by Canto Cinco (C5) Music Ministry. The demo CD is not for commercial purposes. Since the beginning of time, great musicians have used their brilliance to move and inspire humanity. Responding to the call of Vatican II to bring the liturgy closer to the people, Fr. Eduardo P. Hontiveros SJ have used music to bring people to prayer and worship. When Fr. Honti passed away on the 15th of January 2008, he left an enormous collection of liturgical songs, many of which have been sung in churches here and abroad. Who can forget Pananagutan, Dakilang Pag-ibig, Paghahandog ng Sarili (Kunin Mo O Diyos) and Papuri sa Diyos? 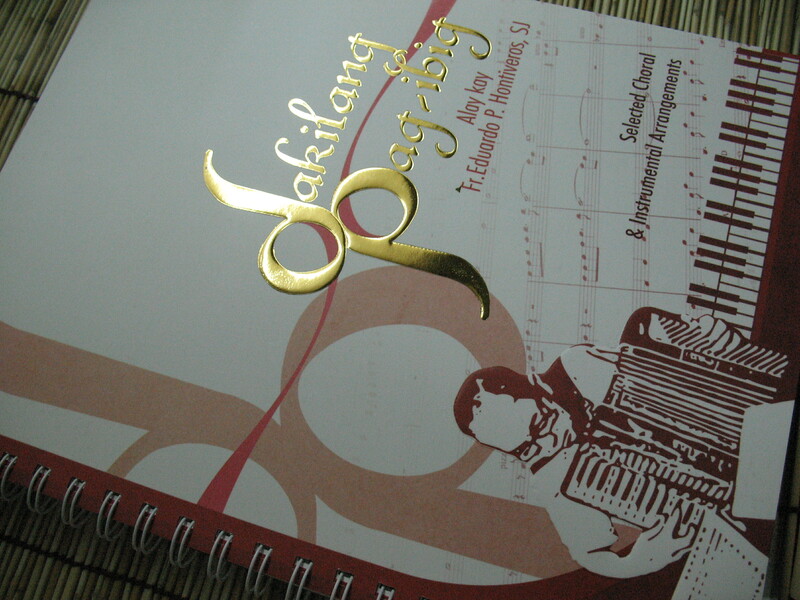 This songbook contains uplifting hymns to God that encapsulate the faith of Filipinos. The simplicity of language and melody marks superb liturgical music: the more the congregation are able to like the melodies and sing them with fervor, the better. We have added new choral and musical arrangements for SATB, string quartet and other instruments to give these songs a new twist. Concert excerpts from Fr. Honti’s Panunuluyan for the Christmas season or the Talinghaga for parables set in music may inspire you to use the complete collection of songs for the stage. But to me, a great songbook is judged by the frequency of its use. The footnotes will then be of importance: it will tell you the liturgical season and parts when the song can be sung. If, however, one of these songs made one whole congregation sing with passionate pleasure to the Lord, then, this songbook will truly have succeeded — and will make Fr. Honti happy. On December 12, 2007, the Jesuit Music Ministry and the UP Chaplaincy held a prayer concert at the Church of the Gesu, Ateneo de Manila University. Musica Chiesa accompanied the University of the Philippines’ religious organizations: ICTUS, UPSCA, Youth for Christ YFC, Christ’s Youth in Action CYA, Canto Cinco (C5), and UP’s premiere chorale, the UP Concert Chorus. The prayer concert prepared students in the Season of Advent. 9 December 2007. Canto Cinco (C5) and Musica Chiesa perform at the main stage of Eastwood City. They sang traditional songs such as Villancico, A La Nanita Nana, Kumukutitap, Carol of the Bells and Diwa ng Pasko. Tuloy na Tuloy was their best performance, with Quincy Gonzales’ rendition of Paglamig ng Hangin. 16 -24 December 2007. 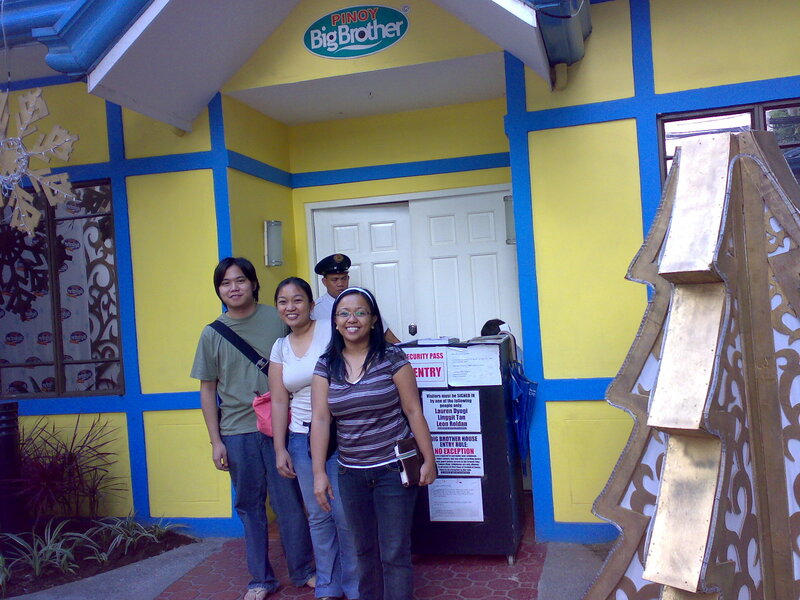 They were, however, geared towards being seen on global television by becoming the choir and musicians for ABS CBN’s Pinoy Big Brother 2 Celebrity Edition. They performed at the Simbanggabi masses and the wedding of PBB winner, Ruben Gonzaga on December 29, 2007. 30 September 2007. Fun was at the Kantahan at Tugtugan the Richie Fernando Covered Courts, Loyola House of Studies, Ateneo de Manila University. The Jesuit Music Ministry’s Canto Cinco Chorale (C5) and Musica Chiesa held a choir training for the choirs of 13 chapels in Payatas. The choirs were organized by Sch. Francis Alvarez SJ and theologians. The program included a talk on Liturgical music and how to choose the songs, the proper way of singing, posture, etc. The repertoire done at the Workshop were advent and Christmas songs. The food was sponsored by JMM and Jollibee. More pictures here and here and here.